Dr. Fifadara takes pride in being a general dentist who can truly do it all. Time for your routine checkup and cleaning? Need a few teeth repaired or replaced? Looking to makeover your smile? At Fulshear Dental, you can trust that she and our team will always have you covered. We’re happy to help any growing smiles you might have at home as well, so feel free to bring the entire family to get the high-quality care they deserve. 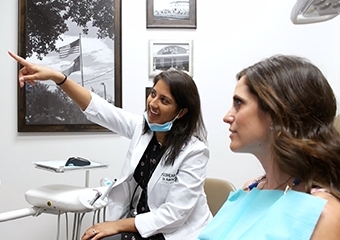 We provide a wide array of services because every smile is unique, and you can learn more about our offered treatments by following the links below. For questions, or to schedule an appointment, contact us today.